This KCV-D372 kit is ideal for your home or business allows you to see who is at your front door without ever having to open the door. It is easy to operate and a very easy installation which requiring only 2 wire this make KCV-D372 perfect for replacing an existing audio intercom with a video intercom system eliminating the hassle of re-wiring. 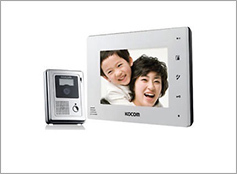 Simply replace the door station and monitor, and you have upgrade your house or office with a video intercom system. KCV-D372 kit (w) slim design of the 7 inch monitor is available in white and comes complete with a digital color LCD screen, KC-MC32 Door Camera and power supply. 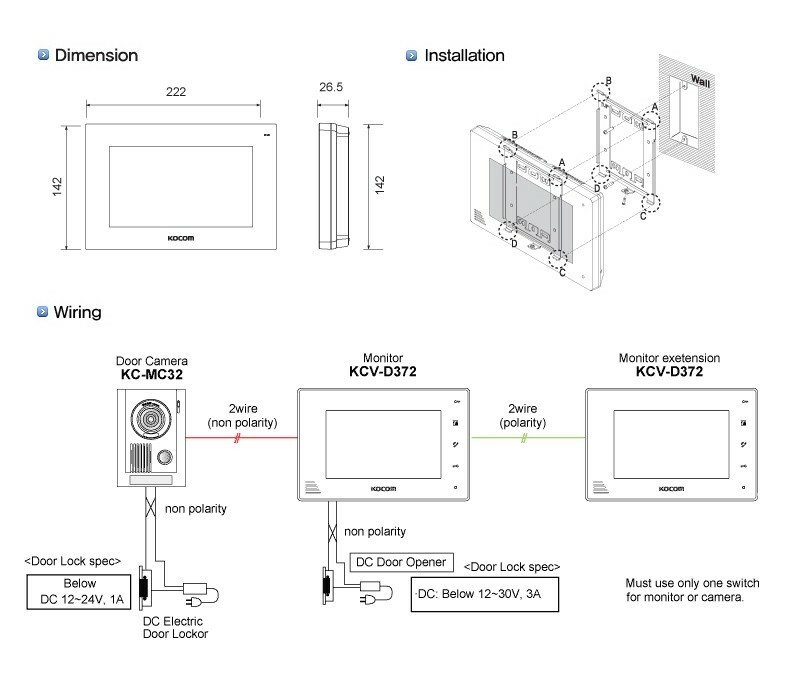 You can connect an additional inside monitor to the Kocom KCV-D372 and KC-MC32 Video Color System Package for a maximum of 1 camera and 2 monitors. The KCV-D372 monitor(s) inside station receive an audible signal - door chime - when the KC-MC32 door camera button is pressed by the visitor. The color LCD screen immediately turns on so you can view who is at your door. When you push the 'speak' button, you can communicate with the visitor at the door. There is also the ability to unlock a door with the addition of a door strike and corresponding power supply (optional). The OSD (on screen display) shows you the mode the system is in when the monitor is on. Another feature of this system is the inside KCV-D372 monitor allows you to monitor the door area. Simply push the monitor button on the screen and you will hear any sounds and monitor the door area.